Talk About a Carbon Footprint! We’ve previously reported about efforts to recycle pollution into usable products, like paint and inks derived from captured air pollution. Now, however, researchers are reducing a carbon footprint by making a carbon footprint. Energy company NRG has devised a way to capture carbon dioxide spewing from power plants and turning that into a polymer, which is then used to create athletic shoes. 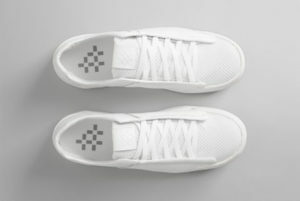 According to the company, 75 percent of the materials for the shoes are made from this polymer, effectively making the shoes ones without a carbon footprint. The recycled carbon dioxide polymer could also be used for a variety of other products and holds promise for reducing carbon emissions. This type of work underscores an awakening in the business sector: people are more concerned with air quality and are now looking at ways of improving it. At AeraMax Professional, we’ve known this for a long time, and have steadfastly advocated for air quality improvements via commercial air filtration. That’s why we offer a complete line of commercial air purifiers with HEPA filters to combat indoor air pollution. Our air cleaning systems remove up to 99.97 percent of airborne contaminants, including germs, allergens, bacteria and volatile organic compounds. A Rose by Any Other Name? How’s the Air in There? Drone On! Put me in, Coach!